Aisha Buhari: a new style of First Lady in Nigeria? Abuja (AFP) - "Few would have believed that the taciturn, austere General Buhari had a soft, smiling and sweet woman at home," the Vanguard daily said after the former military ruler was elected Nigeria's next president. Aisha Buhari remained in the shadows for most of the election campaign but could now impose a very different style from the current First Lady at the presidential villa Aso Rock in Abuja. Little is known for now about the First Lady elect other than a few details in the Nigerian media: she is 44, married her 72-year-old husband in 1989 after he divorced his first wife the previous year, and they have five children together. "I met Aisha Buhari three times, and she seems to be a very humble person, very friendly and a good listener," said lawyer Ebere Ifendu, head of the Women in Politics Forum group in Abuja. The current First Lady, Patience Jonathan, wife of the outgoing president Goodluck Jonathan, has a very different public profile. She is well-known to journalists and mimicked by comedians for her boisterous public appearances as well as political and financial scandals. "Patience has been like a bull in a china shop. No control whatsoever," said Yemisi Ransome-Kuti, head of the Nigeria Network of NGOs. "We are very hopeful that we will have a very different First Lady, who will bring calm and harmony at the presidency." 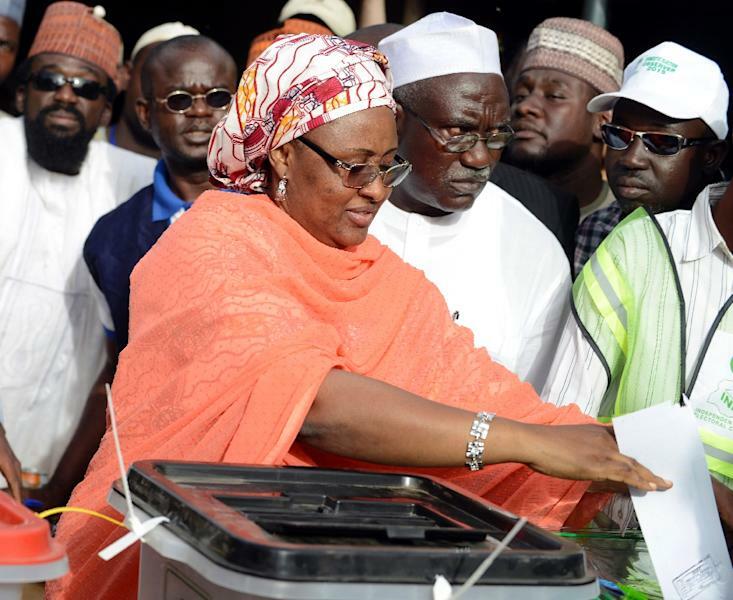 In the large house in a residential area of Abuja where her husband Muhammadu Buhari of the All Progressives Congress (APC) was watching election results come in, Aisha Buhari's calm demeanour contrasted with the tumultuous scenes outside. 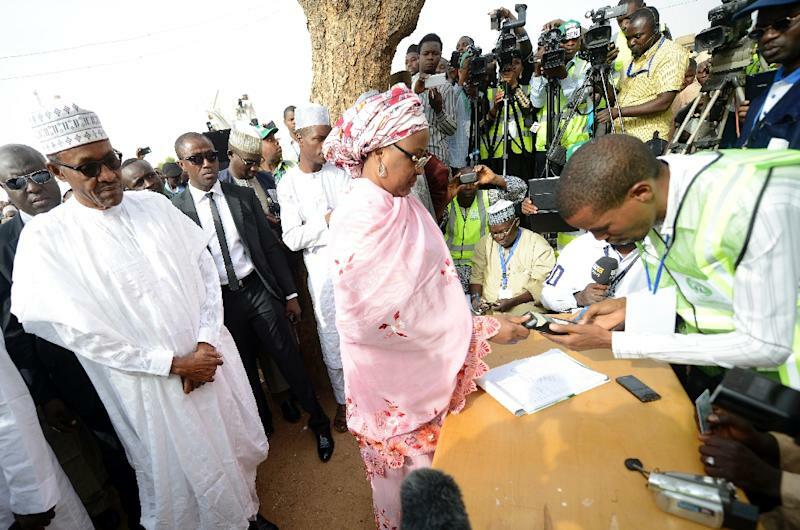 The official vote count was under way and the electoral commission was drip-feeding results for the presidential election state by state until Buhari took an unassailable lead. The APC high command announced victory for their candidate and the news spread around the country, sparking scenes of jubilation, notably in the north's biggest city, Kano. Dressed in a cream-coloured tunic and an orange and pink embroidered headscarf, Aisha Buhari seemed calm and also relieved, despite the magnitude of what had just happened and what was to come. "The long journey has come to an end," she told AFP, referring to the election campaign. But she admitted to "mixed feelings" about the campaign, a low-key reference to the low blows and personal attacks aimed at her husband from the ruling party. Jonathan's Peoples Democratic Party (PDP) accused Buhari, a northern Muslim, of supporting radical Islam, of failing to secure his secondary school certificate and even having terminal cancer. Aisha Buhari preferred instead to talk about the positive aspects of the rollercoaster ride that had led Nigeria to its first democratic transfer of power between parties at the ballot box. Nigeria had nothing to fear from her husband, she said. "I know him personally. Not as a leader of Nigeria. I know him as my husband and I think Nigeria should feel comfortable with him. He will get there," she added. Patience Jonathan for her part tended to add fuel to the flames during the campaign, going as far as urging PDP supporters to "stone" anyone shouting "change" -- the APC campaign slogan. 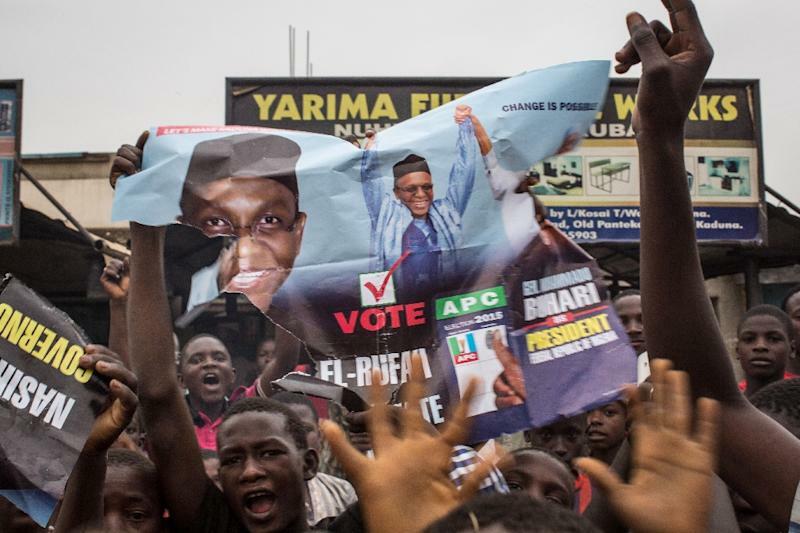 The comments sparked outrage in the APC and led to a furious debate in the Nigerian media. Patience Jonathan -- who styled herself "Mama peace" -- is used to media scandals. Even before the election of her husband as head of state in 2011, she was suspected by the Economic and Financial Crimes Commission in 2006 of having laundered a vast sum of money. In 2012, she became "permanent secretary" of the oil-producing southern state of Bayelsa, where Goodluck Jonathan is from and was a former governor. The opposition heavily criticised the appointment, decrying "nepotism" and "favouritism". She also attracted the ire of civil society when in the aftermath of the mass kidnapping of more than 200 schoolgirls in April last year, one of the leaders of the "Bring Back Our Girls" movement was arrested after meeting the First Lady at the presidential villa. "Maybe she misunderstood her role as the First Lady," suggested Ifendu. "There's no official role for the First Lady in Nigeria. It's not in the constitution," added Ransome-Kuti. Instead, it often depends on what weight the president gives it. "What we are hoping for is more decorum from the office of the First Lady," she said.